Mayo Mats unique construction cradles the bony parts of the cow perfectly, eliminating bed sores. In fact, Mayo Mats are so effective at this that even a raw egg dropped from 7 feet doesn’t break on landing. Mayo Mats are soft, non-absorbent and non-abrasive, and guaranteed to last for 10 years. More than just a cow mat, Mayo Mats are also ideal for horses and zoo animals. The Mayo Mat is made up of millions of tiny closed-air cells that contract and expand as pressure is added and removed. This design gives them two unique advantages over rubber mats or cow mattresses: The Mayo Mat will not permanently compress and harden the way a mattress might, and it will never absorb liquid. Unlike rubber cow beds, the surface of the Mayo Mat is soft and smooth, causing no abrasion to the cows’ hocks or knees. Mayo Mats are made up of a compressible material, allowing the cows hoof to sink slightly into it and form a firm “pocket” that holds her secure. The millions of tiny closed-air cells that make up the Mayo Mat create a soft, yet firm, material that will never absorb liquid. The strength of the Mayo Mat design ensures that it will maintain these traits for an incredible ten years. Mayo Mats are manufactured in the West of Ireland in County Mayo – hence the name. Since our factory only makes mats for cows and horses, we have to do it very well. In fact the Mayo Mat is so successful that it is the largest selling stall bed in the world! The Mayo Mat factory started out as a factory for making EVA sheeting for the soles of athletic shoes. In this form, the material is not tough enough or firm enough for cows or horses. (It does make an excellent human mat and we do sell a superb mat for use by milkers in milking parlors). After some experimentation and changes in the chemical structure of the EVA, a new form of EVA was developed that was perfect for cows. Some years later, the horse mat was developed. The very first mats made for cows from almost 20 years ago are still perfectly functioning in place under cows on a farm in Ireland. Mayo Mats appear to last indefinitely. Mayo Mats outperform mattresses and rubber stall mats and provide an unparalleled degree of cow comfort. Mayo Mat’s seemingly indestructible design allows it to withstand years of use without any noticeable changes to its surface. Most other cow bed brands have to reach a compromise between being non-slip and non-abrasive, but not Mayo Mats. We have completely non-slip and completely non-abrasive products. Mayo Mat’s soft and smooth surface prevents any abrasion to the cows’ hocks or knees. Expect healthier, happier cows and a lower cull rate. A cow cannot slip on a Mayo Mat even though the material is smooth and non-abrasive. The compressible material allows the cow’s hoof to sink slightly into it and form a firm “pocket” that holds her secure. At the same time she can twist in the pocket as she turns into or out of the stall without damaging her foot or the mat. Mayo Mats also provide a great surface for milking decks in parlors and on sloped return alleys due to their non-slip design. Contact us for special installation instructions for sloped return alleys. Mayo Mats are able to withstand compression much better than other rubber mats. Mayo Mats are durable enough to maintain their original shape unlike other rubber mats which flatten out over time and become hard and lumpy. Over the last twenty years we have had many imitators, but they have yet to succeed in reaching the same levels of effectiveness of the Mayo Mat. Our unique chemistry and compression set gives an excellent balance between softness and firmness. Both of these are essential features to have in a mat to maintain healthy cows. If a bed is too soft your cows lose their confidence and can develop ankle soreness and weakness from lack of a firm footing. If it is too firm it will not encourage the cow to lie down and it will become slippery when wet. The Mayo Mat is a perfect balance of firmness and softness and never becomes slippery under any conditions. Within each Mayo Mat there is gas under pressure trapped within the matrix of the mat material. This is the secret to both the mat’s firmness and softness. We have set the density and pressure in our mat to work best for a large, modern Holstein cow. She gets a soft bed but with enough firmness so she doesn’t “bottom out” when her knee or hoof hits it. And yet the gas is compressible so it is not too firm. The result of this delicate balance is a mat with superb shock absorbency so effective that a raw egg can be dropped on the mat from about four feet or more without breaking, yet the mat is firm enough for a cow. This is where the Mayo Mat really shines – there is gas under pressure trapped within the matrix of the mat material. This is the secret to the mats firmness but also the secret to it’s softness. To fully understand the point here, imagine your car’s tire with only 5 psi in it. It would be a very soft spongy ride but every time you hit a rut you’d get a bone jarring shock. In other words, too little firmness is bad. We have set the density and pressure in our mat to work best for a large, modern Holstein cow. She gets a soft bed but with enough firmness so she doesn’t “bottom out” when her knee or hoof hits it. And yet the gas is compressible so it is not too firm. The result of this delicate balance is a mat with superb shock absorbency, so effective that a raw egg can be dropped on the mat from about four feet or more without breaking. It actually bounces off the mat. Yet the mat is firm enough for a cow. Properly installed mats do not require any maintenance and should last indefinitely in free stalls. We believe the mat will perform equally well over time in tie stalls as well. 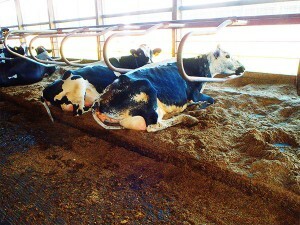 For hygiene, any cow bed should be cleaned periodically. Use a plastic or metal scraper to remove manure from the back of stalls. Do not use powered mechanical methods to clean stalls as this can cause the mats to flex and some bedding may start to get underneath. The Mayo Mat is the most hygienic bed you can put under a cow – it is even more hygienic than sand. The non-stick surface of the mat stays clean even after years of use. We use a small amount of bedding, not for comfort but for dryness. If you currently deep-bed your stalls you can expect to cut your bedding needs back to about 10% of what they were. The durability of the Mayo Mat means it will stay firmly in contact with the concrete preventing bedding from getting underneath it. If you currently use sand you will know that for good maintenance you need to clean off the back of your stalls twice a day. The Mayo Mat it is largely self-cleaning due to its non-stick nature, and the cows backing out of the stalls remove most of the soil themselves. We do recommend sensible maintenance of the mat but the point is that between cleanouts of the stalls the Mayo Mat will stay cleaner than any other bedding method. The Mayo Mat is the most Hygienic bed you can put under a cow – it is even more hygienic than sand. The photo shows Mayo Mats in place after a year. See how the non-stick surface of the mat stays clean. The mats in this photo were not touched for the photo. The shot was taken right after the cows left for milking and this is exactly how the cows left them. Two other things to notice about these mats: We use a small amount of bedding, not for comfort but for dryness. If you currently deep-bed your stalls you can expect to cut your bedding needs back to about 10% of what they were. If you currently use sand you will know that for good maintenance you need to clean off the back of your stalls twice a day. Because of the non-stick nature of the Mayo Mat it is largely self-cleaning and the cows backing out of the stalls remove most of the soil themselves This other photo shows that the area under the cow’s udder is clean in all stalls due to the self cleaning nature of the Mayo Mat. We do recommend sensible maintenance of the mat but the point is that between cleanouts of the stalls the Mayo Mat will stay cleaner than any other bedding method. The second thing to notice is that even after a year the mat is firmly in contact with the concrete and no bedding has worked its way underneath. We point this out because many first-time buyers of Mayo Mats ask questions about this. Although no bedding is required for comfort (the mayo mat is fully comfortable enough) we recommend a small amount of absorbent material for dryness. Use lime, sawdust, wood shavings, etc. Sand can be used but we feel the handling difficulty associated with sand makes it a bad choice. If you usually spread lime on your land then you might consider the lime a free bedding material as you will spread it in the manure and get its value back that way. Did you know a cow makes most of her milk while she is lying down? The reason seems to be that there is an increase in the blood supply to the udder while a cow is lying. A cow should spend at least 50% of her day lying. Further, at least 50% of the cows lying in stalls should be chewing the cud. This promotes good Rumen pH and effective digestion. Cows on Mayo Mats are comfortable cows that are content to stay lying down. A cow lying is a cow allowing her feet to rest and heal from the wear and tear of her normal day’s activities. And a cow with healthy feet is a cow that will get up and drink when she’s thirsty and eat when she’s hungry. Cows on Mayo Mats know there is no pain on their knees or feet when they get up to eat. Cows also learn quickly that the Mayo Mat is a great cushion on their knees when they go to lie down, so they do not put off lying down. You very rarely see a cow standing for any length of time on a Mayo Mat. As a well established manufacturer of cow beds, we offer a written warranty that guarantees customer satisfaction. If through normal wear and tear a Mayo Mat cannot be used as a cow bed, we will replace it free of charge. The warranty period is five years in tie stalls and ten years in free stalls. See our warranty document for complete details.